On Sunday 13th May 2007 members of the public enjoyed junk music and puppet-making with the PickleHerring Theatre Company to launch the River Darwen Litter Trap Project in the community. 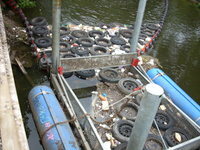 Although we were horrified to see the trap is blighted by fly-tipped waste (I counted 43 tyres - see photos below!) at least the waste will be easier to remove from the trap than they would have been if they had been washed down through the catchment of the River Darwen into the River Ribble and the Ribble Estuary. This highlights the importance of the litter trap and, in a way, is very encouraging. Information about the fly-tipping has been passed on to the Environment Agency and we await the results of their investigation, hoping this will help in the project's most important aim - to prevent litter and debris from getting into the River Darwen in the first place. If you have any information to help the Environment Agency please contact the Incident Hotline on 0800 80 70 60 quoting incident report number 494131. Thanks! Check back here for the latest news about the trap. THE TRAP HAS MADE A BIG DIFFERENCE TO THE LOCAL AREA GIVING IT A CLEANER LOOK. 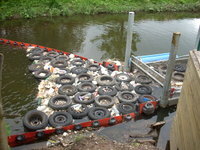 YOU CAN NOW ENJOY THE SCENERY OF THE RIVER WITHOUT THE RUBBISH. ALONG WITH THIS THERE HAS BEEN MANY SIGHTINGS OF WILDLIFE THAT YOU WOULDNT NORMALLY SEE. THE JOB HAS BEEN VERY SUCCESSFUL BOTH WITH THE LOCAL AREA AND THE PEOPLE THAT VISIT THE AREA. Thanks Jane - we regularly update news about the trap on this blog - keep checking back to see what's happening.